← Finish strong…and stay organized! Effective subject lines are critical. A subject line that says, “Question ?? ?” is not going to elicit as quick of a response as, “Respond to Meeting Request by Friday.” Bonus points to you if you can craft a subject line of six words or less followed by “EOM” which stands for “End of Message” and notifies the recipient that they don’t have to open the email. Dissertation via email. If you email is more than twenty lines long don’t expect people to read it. 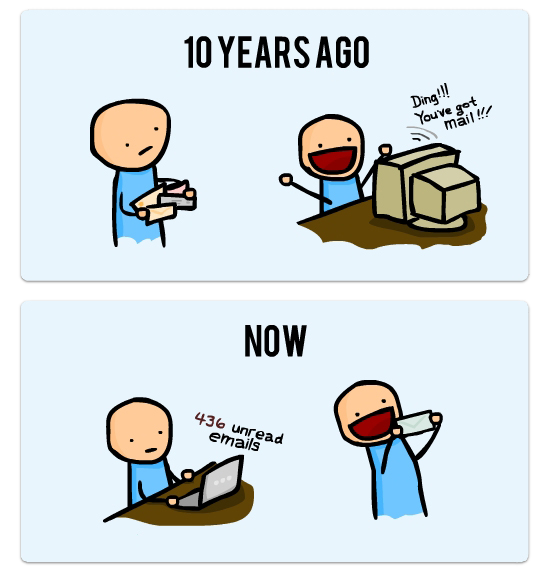 Email in part is designed to be quicker than a phone call, not longer. Overdoing Attention Getters. One bold word (i.e. an important date), that’s helpful. However, when an email looks like it was written with multiple fonts and in Technicolor, you are diluting your message. If everything is important, than nothing is important. Thoughts? Guilty. I do this. Craft several paragraphs and then end with, “Your thoughts?” Avoid open-ended questions, and steer toward more specific questions that elicit targeted responses. Responding too soon. I used to subscribe to the belief that upon returning to the office after leave it was my duty to response to all emails in the order they were received. However, what I have discovered is that if I review starting with the most recent emails received, some questions may have already been answered, and issues already been solved, actually making it permissible for me to delete those email chains. Sending too many emails. Instead of sending ten emails with one thought/question per email, gather your thoughts into one concise email. Your recipient will thank you when they attempt to retrieve a certain piece of information you have shared with them later. Reply to all. Reply to all has it’s place. For instance, when engaged in group discussion in which all parties will need to be privy to the information shared, then by all means reply to all, any, and everyone! However, if it does not, then just answer the person who needs your response. Call to Action/ NNTR. End your email with a call to action. Clearly address exactly what it is you want the recipient to do with this information you have shared. Or, if the recipient does not need to respond, end with NNTR (no need to respond). Now, back to your regularly scheduled emails. EOM. This entry was posted in Uncategorized and tagged communications, email, time management. Bookmark the permalink.